a limited number due to the massive production of the show, promising an ultimate concert experience in the group’s first visit to the country. Tickets will be available from 28 July 2012, 1030hrs at ticketing booths and online bookings via Ticketcharge and Red Tix. VVIP tickets (Cat 1, RM688) and premiere rock pit tickets (Cat 2, RM588) are expected to sell the quickest, with only 600 VVIP tickets that will offer the best views and closest proximity to the stage, while 1,400 premiere rock pit tickets will give fans the chance to jump and party along right in the middle of the pulsating action. BIGBANG, consisting of G-Dragon, TOP, Taeyang, Daesung and Seungri, is undoubtedly the biggest K-pop act to hold a world tour this year, a much-anticipated concert that has led to sold-out nights across Korea, Japan, Singapore and Indonesia. Malaysia will possibly witness the best concert experience in recent years with a production value of more than RM 4 million, before the global superstars take on America and Europe to perform in a total of 16 countries and 25 cities. Fans can expect a perfectly choreographed laser light show, fire flames, a huge stage with two rock pits in the thick of the action, and sprawling LED screens across the stadium for a 360-degree view of the action on stage. 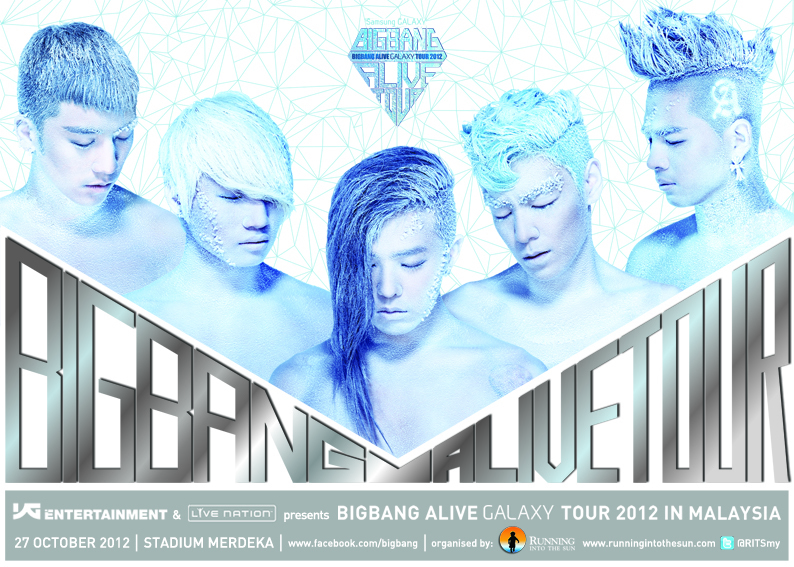 BIGBANG Alive Galaxy Tour 2012 Malaysia could very well be epitomic of Malaysia’s growing music and concert scene, and Running Into The Sun had deliberately priced the lowest tier tickets at a friendly RM 98 to ensure as many Malaysians will be part of this incredible show. “This is a concert we believe everyone needs to watch at least once in their lifetime – it has a perfect combination of pure talent; spectacular special effects; and amazingly contagious energy, all choreographed beautifully to give you a masterpiece of music celebration. It is our aim to share this experience with as many people as possible thus we deliberately introduced a RM98 tier to keep tickets friendly”, says Creative Director of Running Into The Sun Beatrice Chia-Richmond. In anticipation of the show, fans of Big Bang, or VIPs as they fondly call themselves, have been rousing in excitement ever since the official announcement of the concert, witnessed by the massive online buzz on Running Into The Sun’s Facebook and Twitter pages, coupled with fervent fan clubs already preparing various fan projects to give Big Bang a warm welcome to the country. BIGBANG Alive Galaxy Tour 2012 Malaysia is presented by Samsung Galaxy in collaboration with YG Entertainment and Live Nation Entertainment, and organised by Running Into The Sun. why is it in bigbang official schedule at https://www.facebook.com/BIGBANG/app_375421659159963 the ticket is not on sale yet, but here it’s already on sale??? sorry i’m just concern bout the originality of the ticket because this is my 1st time thinkin’ of buyin’ concert’s ticket. tq. Tickets will be available from 28 July 2012, 1030hrs at ticketing booths and online bookings via Ticketcharge and Red Tix. 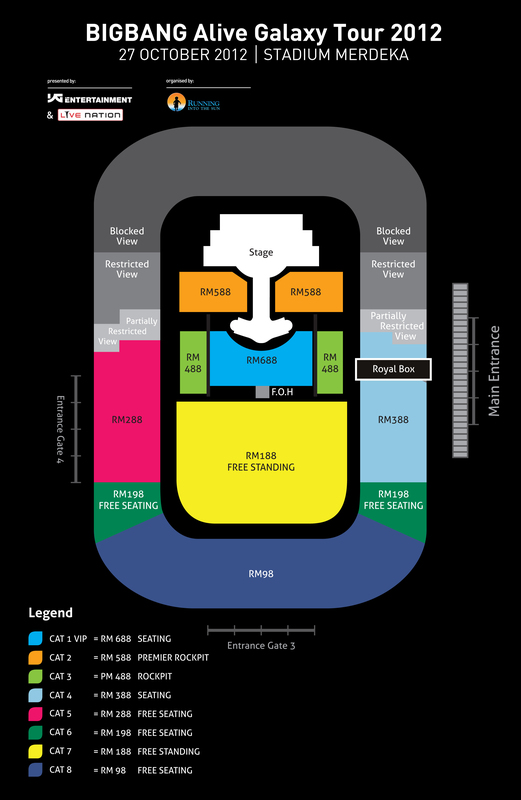 may i know where is the ticketing booth at ?